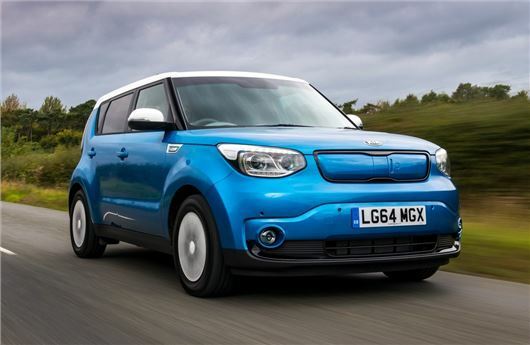 The Kia Soul EV has gone on sale in the UK priced at £24,995 after the Government plug-in car grant of £5000. Powered by lithium-ion polymer batteries, the electric version of the Soul has a range of up to 132 miles and can be fully charged in five hours via a fast-charge point. The electric motor in the Soul EV has 81.4kw which is equivalent to around 110PS - plus its 285Nm of torque is available from a standstill. While the motor makes minimal noise, the Soul EV is fitted with a virtual engine sound system at low speeds, so that pedestrians can hear it coming. Performance from 0-60mph is 10.8 seconds while the top speed is 90mph. Whenever the car is braking or coasting, the kinetic energy is captured through the regenerative braking system. As a result, the range is continually topped up. On the outside, the Soul EV has the same dimensions as the standard Soul but comes without a grille or fuel filler flap and gets different rear light clusters. Boot space is cut to 281 litres because the luggage undertray houses both charging cables. The Soul EV comes in either Caribbean Blue metallic with a white roof or Titanium Silver metallic. The interior upholstery is Grey Eco cloth with blue stitching, while the fascia panel, door inserts and gear selector are finished in gloss white. The instrument cluster housing, door inserts, steering wheel and gearshifter are trimmed in leather.